Learn how to make this sweet banana pound cake recipe from scratch! It’s really moist & tender, even with no heavy cream, refined flour or sugar! Just 136 calories too! On the final morning of my New England trip, a car service picked us up at the adorable little Vermont inn to chauffeur us to the airport. As a two-hour trek to the Hartford airport, my driver arrived before 6 am, and I felt so relieved that Pamela (the blogger behind Brooklyn Farm Girl!) was sharing a ride since her flight left around the same time as mine. With very little time to talk during our trip, Pamela and I ended up chatting the entire way to the airport. When we checked the departures list and realized our flights left out of adjacent gates, we passed through the security checkpoint together and walked through the terminal in search of coffee before sitting down in the chairs in front of our gates. Although she ordered an iced latte, I opted for regular hot coffee to warm up from the chilly rain pouring down outside. About halfway through my cup, I shed my warm winter jacket. My fingers and toes stopped feeling numb, thanks to the coffee! Nearly two hours later, my flight began boarding, so I hugged Pamela good-bye before getting in line. Once I reached my seat and placed my suitcase in the overhead bin, I pulled off my scarf… And realized I had left my jacket in the terminal. I raced back, only pausing a moment to double check with the gate agents that it was okay, and when I reached the row of chairs we had occupied… There was my nice black jacket, perfectly camouflaged by the black leather seats. Whew! The bunch of bananas sitting on my kitchen counter! But I actually felt excited about that memory lapse because it meant I could bake this Healthy Banana Pound Cake with them! 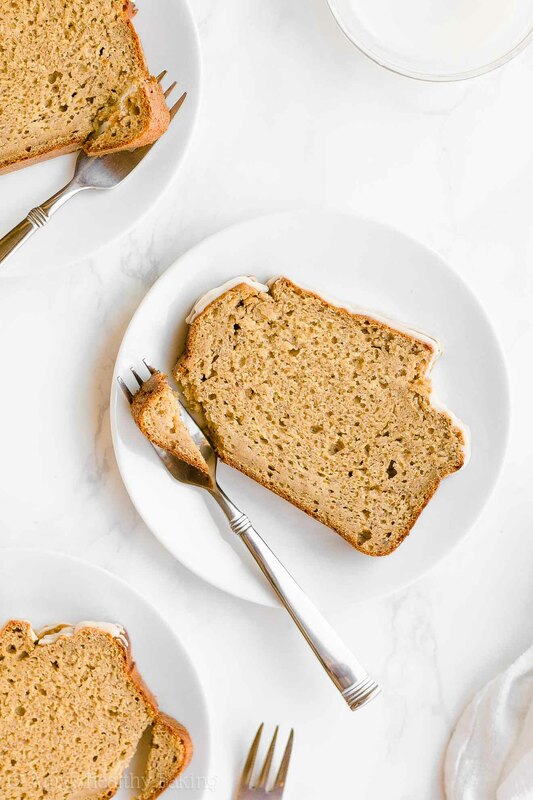 This healthy cake recipe is surprisingly simple to make (no mixer required!) 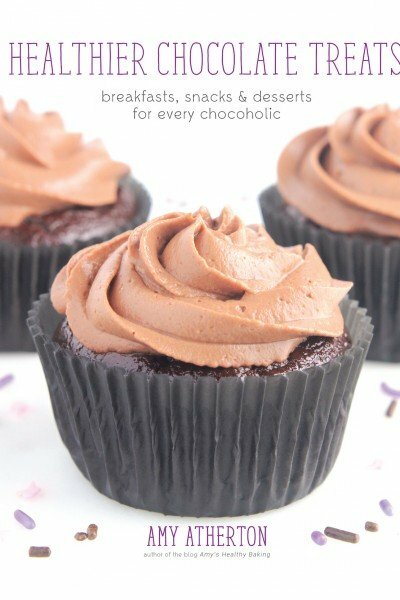 and tastes extremely moist and tender, even with no heavy cream, refined flour or sugar. It’s also just 136 calories! 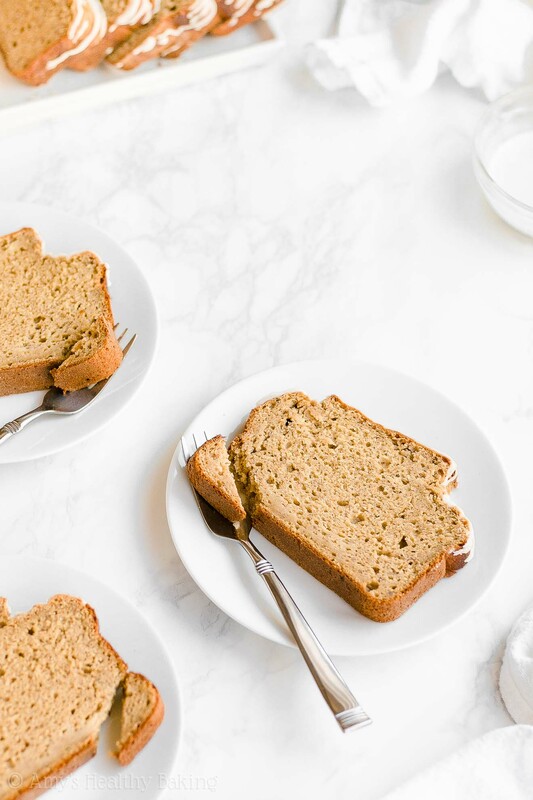 Let’s go over how to make this healthy banana pound cake! First off, traditional pound cakes earned their name because they contained a pound of four main ingredients: all-purpose flour, granulated sugar, eggs, and butter. Yikes! That’s a lot of calories… And I certainly don’t have enough hours in the day to exercise and burn all of them off! 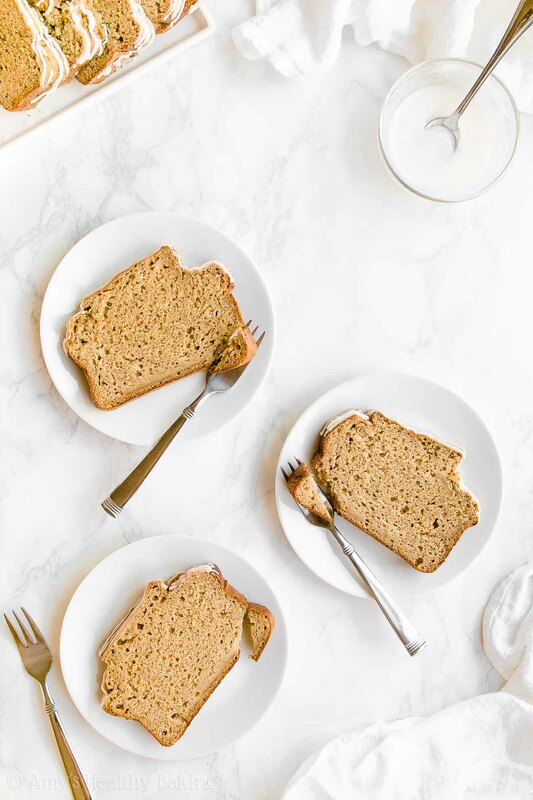 Hence why we’re making this healthy banana pound cake instead! ? You’ll start with white whole wheat flour (this kind!) and just a hint of cinnamon (this kind is my favorite!). 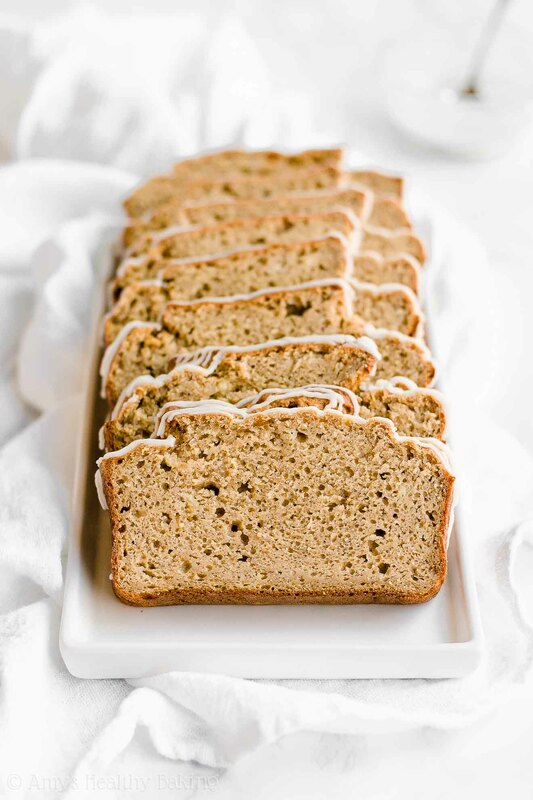 The cinnamon adds a subtle richness and warmth to this healthy banana pound cake’s flavor. Yum! 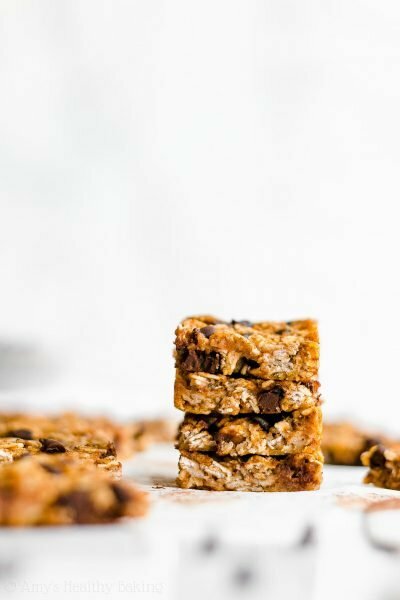 I know it sounds confusing, but white whole wheat flour actually exists—and it’s not a combination of white (aka all-purpose) flour and regular whole wheat flour! White whole wheat flour is named because it’s made by finely grinding a special type of soft white wheat. Regular whole wheat flour comes from a heartier variety of red wheat. 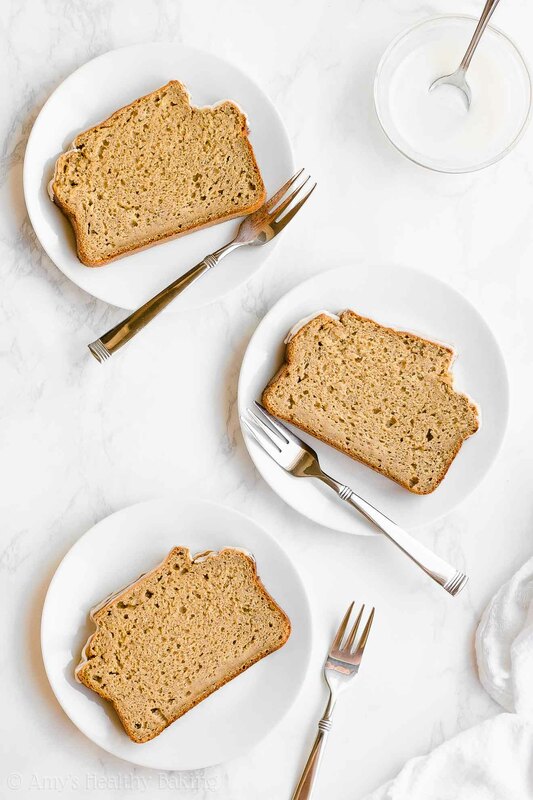 They have the same health benefits, but white whole wheat flour has a lighter taste and texture… And that lets the sweet banana flavor of this healthy pound cake truly shine! Hint: The difference between white whole wheat flour and regular whole wheat flour is similar to the difference between green and red grapes. Same health benefits, just a slightly different flavor! You’ll also skip the pound of butter (around 2 cups!) and pound of eggs (about 9 of them!). 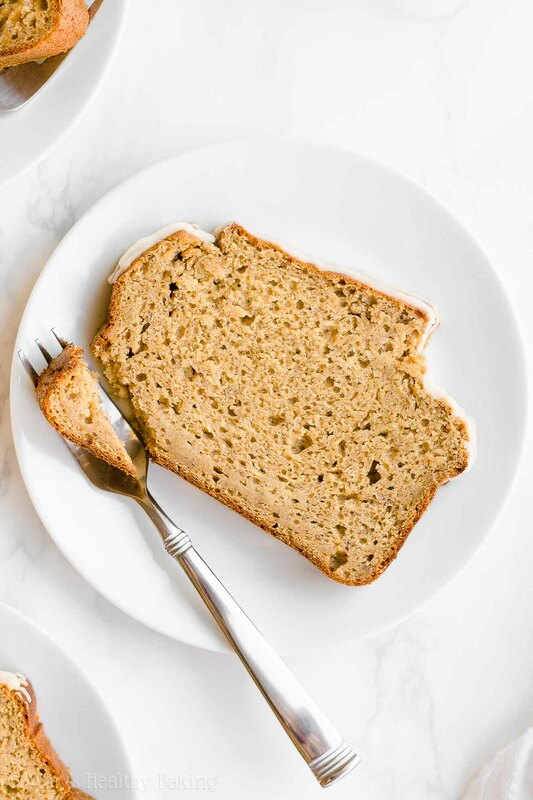 That really helps keep this healthy banana pound cake low in calories! Instead, you just need 1 tablespoon of butter and 3 egg whites. Yes, that’s it! 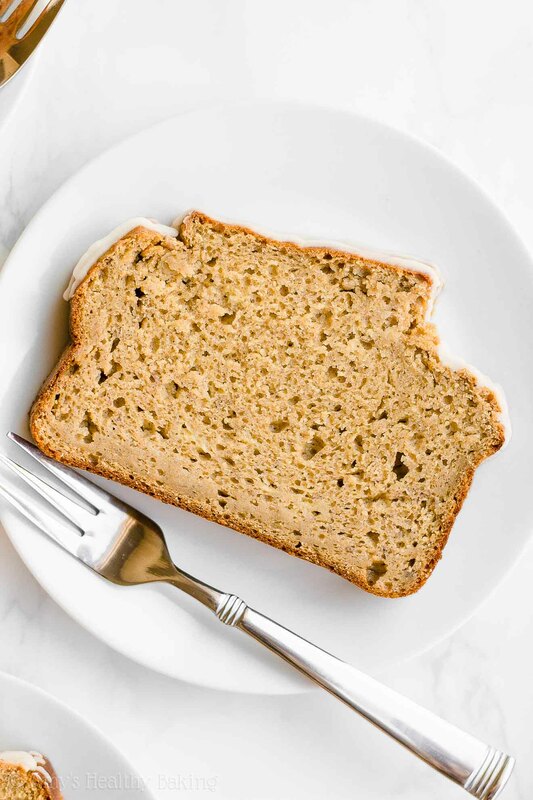 Then the rest of this healthy banana pound cake’s tender texture comes from two other ingredients: mashed banana and Greek yogurt. If you’ve read my blog before, then you probably know how much I love baking with Greek yogurt! 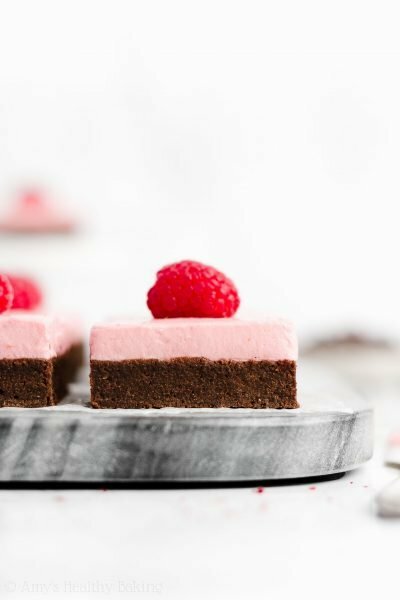 It adds the same moisture to your cake batter as extra butter or oil but for a fraction of the calories, and it gives your baked treats a protein boost, too! The mashed banana adds a lot of moisture, just like the Greek yogurt, but it also adds flavor (obvious, I’m sure!) and natural sweetness. This is why I strongly recommend using bananas with more brown color than yellow. See those bananas? That’s the minimum amount of brown spots I recommend. More is even better! Once your healthy banana pound cake has cooled, it’s time to add a little drizzle! The glaze is totally optional, and when I’m feeling lazy, I often omit it. But it does make the cake look a bit prettier, doesn’t it? The drizzle is also easy to make—and no powdered sugar necessary! Instead, you’ll use confectioners’ style erythritol (this kind!) mixed with a little milk. Just add that to a zip-topped bag, snip off a tiny piece of one corner, and drizzle it all over your healthy banana pound cake! Time to eat! 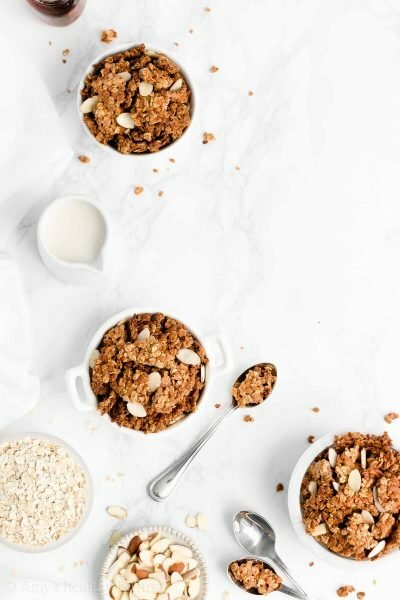 And when you make your own, remember to snap a picture and share it on Instagram using #amyshealthybaking and tagging @amyshealthybaking IN the photo itself! (That guarantees I’ll see your picture! ?) 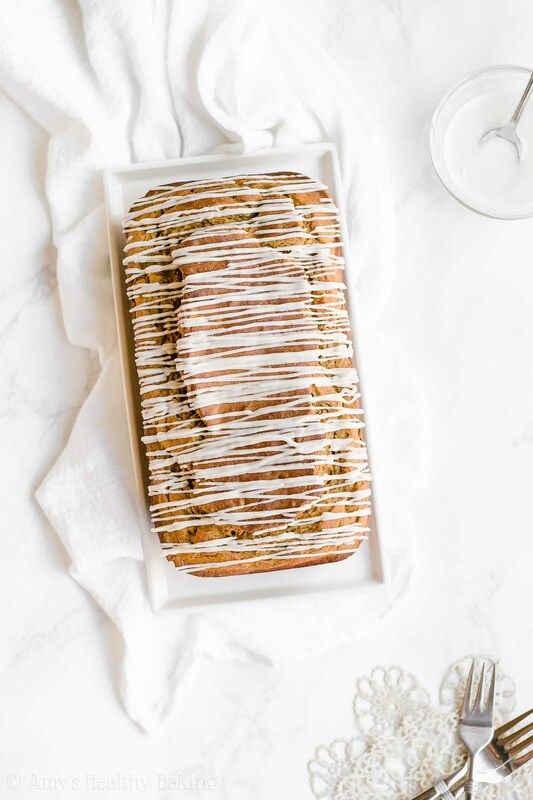 I’d love to see your healthy banana pound cake! This is one of my all-time favorite banana cake recipes! It’s really moist and tender, and the sweet banana flavor truly shines. The cake is best if eaten the same day it’s drizzled, but leftovers will keep for at least one week if stored in the refrigerator in an airtight container or tightly wrapped in plastic wrap. Spread the batter into the prepared pan. Bake at 350°F for 55-65 minutes or until the top feels firm to the touch and a toothpick inserted into the center comes out clean. Cool in the pan for 10 minutes before carefully transferring the pound cake to a wire rack to cool completely. Once the cake has fully cooled and just before serving it, prepare the drizzle by stirring together the confectioners’ style erythritol and milk in a small bowl. Transfer the mixture to a small zip-topped bag, cut off a tiny piece of one corner, and drizzle on top of the cooled cake. I do not recommend substituting for the liquid stevia, if at all possible. 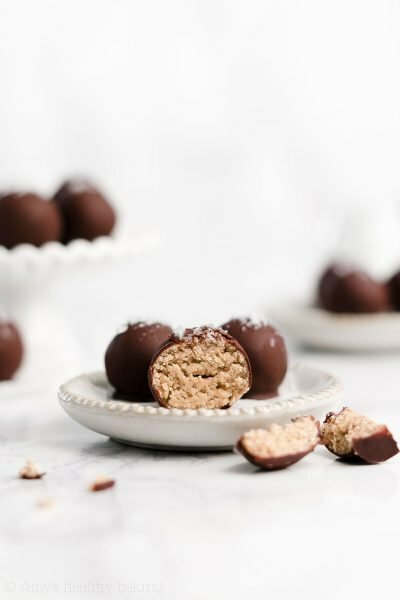 (It’s one of my favorite ingredients, and you’ll use it in all of these recipes of mine, too!) This is the exact liquid stevia that I use, and I buy it online here because that’s the cheapest price I’ve found! For a sweeter pound cake, increase the liquid stevia by an additional ½ to 1 teaspoon. However, if you really prefer to omit the liquid stevia from the cake, substitute 1 ¼ cups (240g) granulated sugar and reduce the milk to ¼ cup, but the cake will no longer be clean-eating friendly. You may substitute 1 ¼ cups (240g) coconut sugar and reduce the milk to ¼ cup to keep the cake clean eating friendly, but it will be much darker in color. The baking time may vary with either of those substitutions as well. I don’t recommend substituting pure maple syrup, honey, or agave because they’ll add too much liquid to the batter. 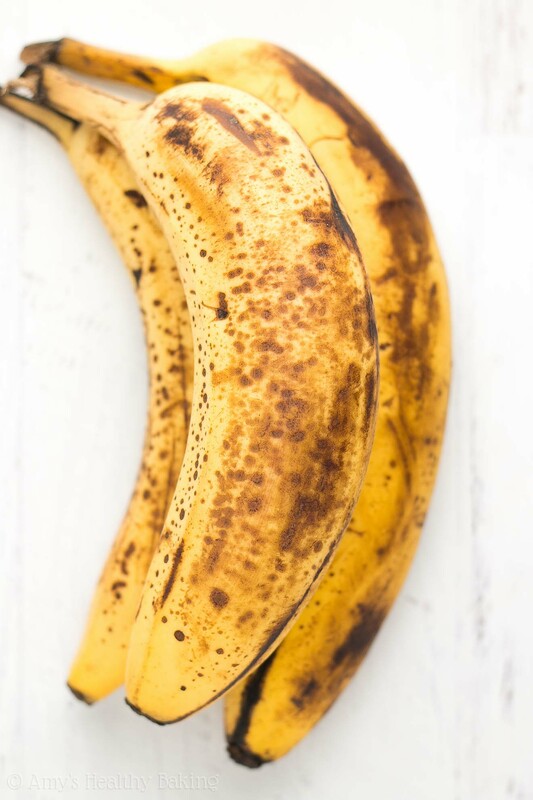 Measure the mashed banana by grams or by cups, NOT by “2 medium bananas.” Not all medium bananas are the same, so your cake probably won’t turn out right unless you measure with grams or cups. The Greek yogurt and mashed banana need to total 1 ½ cups. If you have slightly more mashed banana, then decrease the Greek yogurt by the same amount (and vice versa!). This is the confectioners’ style erythritol that I use. If you prefer, regular confectioners’ style (powdered) sugar may be substituted in the drizzle, but start with just 1 teaspoon of milk because regular powdered sugar is much more absorbent than the erythritol! Do not use an electric mixer to mix up the batter. This will result in a dense or tough cake. Use a whisk where specifically instructed, and use a fork for everything else. 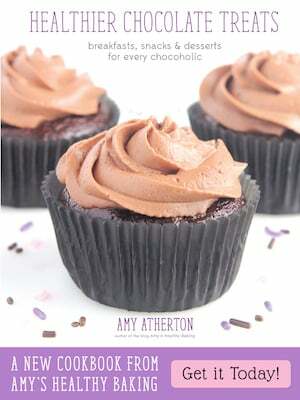 ♡ …and the rest of Amy’s healthy pound cake recipes! Perfect treat to make after your trip; and thank goodness you got your jacket back! Is there a way to have the nutritional information print with the recipes instead of as a separate printing? I’ll bring it up the next time I speak with my website developer! 🙂 I can’t wait to hear what you think of this pound cake Linda! Thank you for your lovely recipes Amy, I made this cake today and it turned out great! I tried a lot of your recipes already and they (almost) always turn out great. And not too forget they are so much more healthier. Hi Amy, I’m excited to try these out! I have a question though; would I be able to use granulated stevia sweetener? If I do the conversion i think it would be around 10 and a 1/2 tablespoons? Not sure at all as I’m new to baking. Hi Amy, how does this differ in taste from your ultimate banana bread? Does this have a more cake like and softer texture as well? No need to apologize Thireindar — it’s happened many times before! 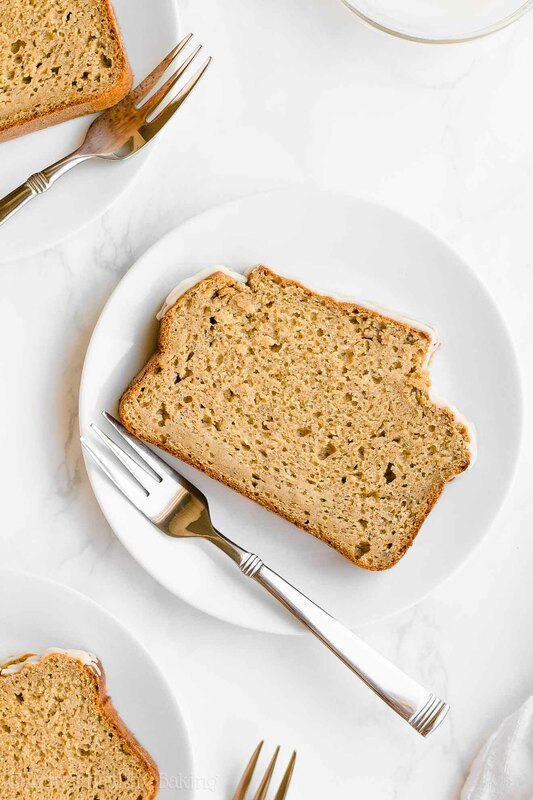 🙂 This banana pound cake is much sweeter than my ultimate healthy banana bread. It’s meant to be a dessert, whereas the banana bread is meant to be eaten for breakfast. The texture is a bit softer, but it’s not supremely light and fluffy like angel food cake. Pound cakes are meant to be on the somewhat denser side, so it’ll be fairly similar to the banana bread. I can’t wait to hear what you think of this pound cake if you try it! is the cupcake version lighter than this? and are the cupcakes sweeter? i notice there is eggwhites in the cupcakes. thanks a lot.